Cisco Catalyst 3750 Series Switches are a line of fixed-configuration (8, 12, 24 or 48 port), stackable, enterprise-class, multi-layer Fast Ethernet and gigabit Ethernet switches. 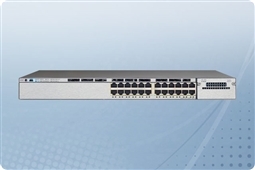 On select models, the Cisco Catalyst 3750 series also provides power over Ethernet (PoE) capabilities as well as SFP based uplinks for gigabit fibre connectivity, allowing it to serve as either a powerful access layer switch for larger wiring closets or as a backbone switch for smaller networks. The Cisco Catalyst 3750 Series solutions enhance business productivity while providing a high level of security, scalability and ease of management. The Cisco Catalyst 3750 series is a great solution for those looking to deploy IP telephony, wireless or gigabit service to the desktop (GTTD). The next generation Cisco Catalyst 3750 v2 series is a great energy efficient option for multi-layer access switching for the network closet, retail location and branch-office alike, providing a solid unified network for data, voice, and video! Aventis Systems is proud to offer our Cisco Catalyst 3750 Series Switches all with a 1 Year Standard Comprehensive Warranty with upgrades available to Express Parts Next Business Day Replacement or Extended Term Warranties as well as Onsite Hardware Support Agreements. So please shop our Cisco Catalyst 3750 Series Switches below and the best in energy savings and multi-layer access to help your business Get IT Done today!